Unlike airfares, for which airlines now have to disclose taxes and fees up front, car-rental companies can still bury extra costs in the fine print, leaving you with serious sticker shock at the checkout desk. Read on for the scoop about 10 such hidden fees—and how to avoid the worst of them. Airport Fee: The most convenient place to pick up a rental car is oftentimes at the airport—but it will cost you. Car-rental companies have to pay a “concession fee” to the airport in order to operate near it, and they pass those fees on to the consumer. Avoid the charge by picking up your car at a location a bit farther out, but make sure you either find one with a free shuttle or price how much it will cost you to take public transportation or a taxi to a different location—the price difference might not be worth it. 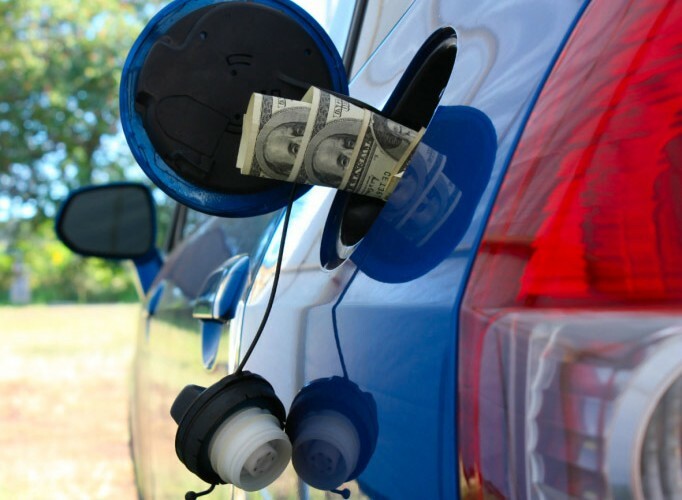 Fuel Charge: Better top off the tank before you return that rental car—otherwise you’ll get hit with a “refueling fee,” which includes the cost of gasoline and a hefty “convenience” charge. According to The Consumerist, some rental companies are charging over $9 per gallon in fees! Make sure you note how much gasoline was in the tank when you picked up the car, and then swing by a gas station on your way to return the vehicle. Collision Damage Waiver: If you get in an accident with your rental car, you can be liable for an extremely high insurance deductible—sometimes thousands of dollars. So, rental car companies try to sell you the Collision Damage Waiver (CDW) for an extra fee (usually around $20 per day). However, most credit-card companies already offer automatic zero-deductible collision coverage, so check your policy before shelling out for the rental car’s extra coverage. Early Return Fee: Everyone knows you can expect to be fined for returning a car late, but did you know you can also be charged for returning a car early? Some rental-car companies will charge you for “breaking your contract” by returning the car early or say that any discount you got for booking a car for multiple days was voided by returning the car early. DailyFinance.com has a clever solution to the problem, saying that you could park your car nearby and then later call for roadside assistance to tow the rental car back to the company. Stadium Tax: Surprised to see a “downtown arena” or “stadium tax” charge on your bill when you’re not planning on going anywhere near a sports center? Many counties have laws that add taxes to fund stadiums to rental-car prices, forcing visitors to fund something they aren’t going to use. The car-rental companies just tack the required fee right onto the bill, and there’s no way to get out of it. Frequent-Flyer Fee: Major car-rental agencies are now charging consumers who want to use the car to earn airline miles. (Many airlines give customers points for renting with partnered companies.) Find out how much the fee will be and then consider if the miles you’ll earn will be worth the cost—or if you’ll actually be losing money on the deal. Online Travel Agent (OTA) Insurance: If you book a car through an OTA like Expedia, the website is going to try and sell you its own rental-car insurance. But odds are you don’t need it, and it’s usually pricier than regular insurance. Again, check your credit card as well as any existing auto insurance that you have to see if you’re covered before signing up for what the OTA is offering. Also, you should carefully read the terms of the policy offered by the OTA—SmartMoney reports on an incident where a consumer rented a car from Expedia and opted for the insurance through them, only to find out when she picked up the car that the type of car she was renting was not covered by the policy Expedia had sold her. Vehicle Licensing Fee: Also known as a VLF or Road Tax, this is another unavoidable charge. If you’re renting a car in Europe, you’ll often see a fee of around $5 per day on your bill—it’s the rental-car company passing along the cost of vehicle permits and taxes to the consumer. What’s the sneakiest rental car fee you’ve ever been charged? Tell us in the comments!